I hope you all are having a wonderful week so far. Linked in my first monthly newsletter of the year: my April newsletter! This month topics are a recap of Spring Board, overview of upcoming events, and review of the year ahead. You’ll also find some fun facts about myself and unforgettable memories in it from Spring Board. Please check it out and let me know of any questions, concerns, etc. you may have. As always, my email ashley@ktkey.org is open to you. 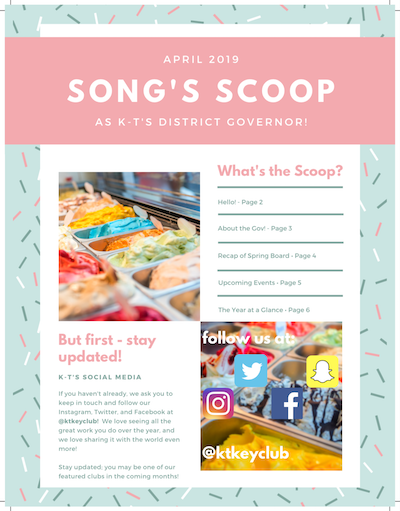 And every month, there will always be a Scoop for you! After a busy week of reviewing applications, I am very excited to announce our 2019-2020 District Board Appointments: Andrew Miller of Division 5A has been appointed District Historian, and Aiden Hamade of Division 12 has been appointed Bulletin Editor. I am confident these appointees will not only serve the District to their utmost ability, but also build on the prior successes of previous Boards to help effect a monumental year. In addition, I would like to thank each and every applicant for devoting time into crafting their applications. Every application I read reinforced the tremendous demographic and potential of the KT District. We really have some incredible members among us! If you are a freshman or sophomore, I encourage you to adopt a leadership role in your home club this upcoming year and reapply (or even run!) for a position next year. If you are a junior, I urge you to lead in your home clubs and wish you a productive senior year and the very best in your future endeavors. Once again, thank you for your commitment to Key Club and its objectives; please do not hesitate to reach out to me with any questions, comments, or concerns over the year. To begin, I would like to thank you all for your wonderful attendance at last week’s District Convention. It was such an inspirational and exciting weekend, and I hope to see you all again next year in Lexington, Kentucky! I would also like to introduce myself: my name is Ashley Song, the newly elected Kentucky-Tennessee District Governor for the 2019-2020 term. A little about me: I am from Division 15 and a junior at Rossview High School in Clarksville, Tennessee. Thanks to your incredible support, I had the honor of being elected as your District Governor. I am anticipating amazing growth and achievement this upcoming year. My first order of business is appointing a District Bulletin Editor and a District Historian. Below are the applications for the positions. If you choose to submit an application, please read through the time requirement and duties very carefully, as it is very important that you are able to attend every event and fulfill all of the duties that the District asks of you. Because our Spring Board Meeting is April 12-14th, there is an extreme time constraint regarding these appointments. Therefore, applications must be submitted by April 4th at 4ET/3CT to be considered and for appointments to be made in a timely manner. Please send them to my email at aashleysong@yahoo.com. Additionally, I will also be conducting phone interviews with applicants, so if you apply, please be attentive to those. If you yourself or someone you know is interested in applying, please let them know applications are officially live! I am looking forward to receiving your applications! Please do not hesitate to email me with any questions or concerns. Happy applying! Oh! If you attended the convention, you can help us make future conventions even better by taking a short survey. Your feedback is important to us. It’s short and won’t take long to complete. Did you attend DCON last weekend in Franklin, TN? How did you like waking up to a hot biscuit on Saturday morning? What about hanging out with our keynote speaker, Patrick Maurer? Did you attend an exceptional workshop? Tell us about it. If you attended the convention, you can help us make future conventions even better by taking a short survey. Your feedback is important to us. It’s short and won’t take long to complete.